With its Big Boi and Cee-Lo appearances and Jazze Pha production, one could argue that "In Da Wind" is more of an Atlanta product than a Miami one. And they might be right. But that would be a disservice to a song supported by the best-looking and most geographically diverse rap video ever filmed in Miami, and the fact that this is the track in which Trick Daddy coined his classic "Trick love the kids" catchphrase. 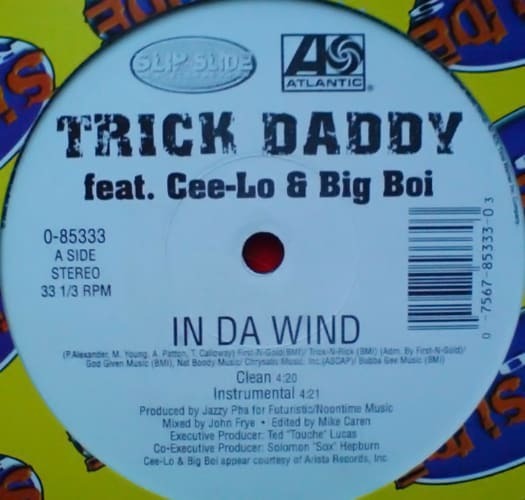 But what makes "In Da Wind" truly great is the undeniable chemistry between Trick, who's at his most thoughtful and reflective here, and Cee-Lo, who brings a soulful hook that surely ranks among his greatest cameos.